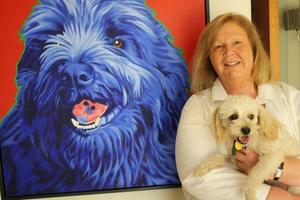 Windsor, the first dog Wetmore rescued, has been forever captured in a colorful oversized canvas by artist Suzanne Shirra. Kathy Wetmore, founder of Shaggy Dog Rescue, is a 501(c)(3) Non-Profit animal welfare organization dedicated to providing rescue services, vet care, foster care, and adoptive placement to stray and abandoned shaggy dogs. All of your animals are vaccinated, spayed or neutered, micro-chipped, and on heart-worm preventative. All animals in our program are fostered by individuals who keep the dog in their residence until it is adopted. Please consider becoming a foster parent and opening your home to a dog in need of love and care.